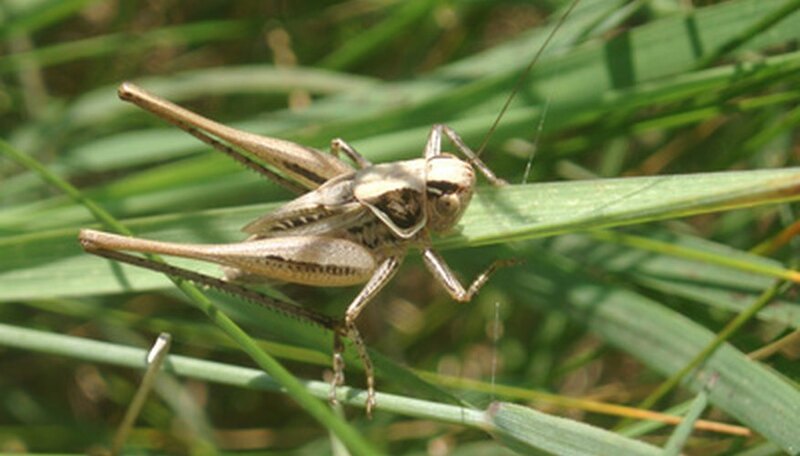 Grasshoppers are known to feed on crops and plants, but they also feed on grasses. If you have a high population of grasshoppers, they may be damaging your lawn. Because grasshoppers migrate and move about, they are one of the hardest insects to control. Fortunately, it is not impossible, especially if you begin treatment as the eggs are hatching or while the grasshoppers are still nymphs, which molt several times before becoming adult grasshoppers. Monitor the grasshopper population. If you notice them in the late summer or early fall, expect to have a high population of grasshoppers the following year. This will help you treat the problem early the following year when treatment is more effective. Apply an insecticide, such as one that contains acephate or carbaryl, to your grass in large, even sweeping motions (always follow manufacturer directions). Don’t worry about getting every square inch of your grass; covering your lawn by just 50 percent is effective enough since grasshoppers are very mobile. You can apply an insecticide when you see lots of grasshoppers, but it is more effective in the spring or early summer when the grasshoppers are hatching and/or are still nymphs. Apply insect baits that contain the ingredient Nosema locustae, which only work on young grasshoppers. Locate breeding grounds if possible and place the baits there. Look for large amounts of nymphs and for egg beds. Eggs are laid in the top 2 inches of soil with about 20 to 100 small, tannish eggs in one area. Purchase some chickens, turkeys or guinea hens, which feed upon grasshoppers. Fence in your vegetable garden to protect your crops from your new pets, if applicable.